In The Witcher 3: Blood and Wine, you will get three new endings, of which only one is good. 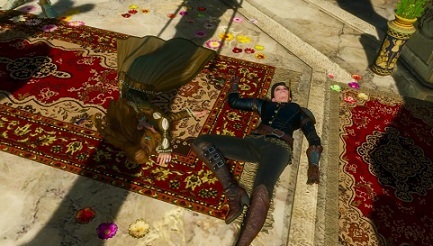 In this case, all decisions and consequences of Blood and Wine involve the sisters Syanna and Anna Henrietta with whom you can go even romance. The following ends you can unlock in the new DLC Blood and Wine. - While during the main quest: The Night Of The Long Fangs, you must make the decision to help Syanna. - Read all the entries in the journal, once you have arrived in the playroom (happens automatically during the quest). - During the Quest Beyond Hill and Dale, you have to talk to the little girl who sells flint and get the jewelry ribbon from her, it does not matter if you paid 500 crowns or win a match of Gwent. "Cause she turned her back on you, forgot about you." "Ever thought about to forgive her?" "Got bad news. Syanna was out to kill you. " "You were children then, both." And that’s it! Answer them correctly to unlock the good end in The Witcher 3: Blood and Wine. - During the main quest The Night Of The Long Fangs, you have to make the decision to help Syanna. - During the Quest Beyond Hill and Dale you ignore the little girl and don’t get that jewelry ribbon. - So Dettlaff can kill Syanna and you will put in jail. Probably the most dramatic end in The Witcher 3: Blood and Wine, both sisters will die. This affects all Toussaint and everything falls into depression! - Take the decision, the main quest to follow the unseen elders during the night of the long fangs. - During the quest Pomp And Strange Circumstance don’t go to Syanna and let the ceremony take equal. The two decisions cause Syanna kills Anna and Damien then Syanna steals your breath. Never tolerate it, and die together. Ciri playing The Witcher 3 an essential role and even in every corner of it comes to you. Do you have luck, you manage without the help of one of the two good ends for Geralt to earn stepdaughter. There are five choices in dialogues between Geralt and Ciri, which pass through the consequences to different endings. The list can ascertain the conditions that lead you to the ends mentioned in The Witcher 3. - Good Endings (1): One of the ends in Witcher 3 makes Ciri a Sorceress. For this you need to fulfill next: make a snowball fight with Ciri after the Battle of Kaer Morhen, refuse the reward for Ciris rescue, not accompany Ciri to talk to the sorceresses, can destroy Ciri Avalac'hs laboratory and visit with her to Skjalls grave. Bring Ciri not to Kaiser Emhyr van Emreis so she can go her own way. - Good Finish (2): The second good end in The Witcher 3 makes Ciri Empress of Nilfgaard. Decides as follows: make a snowball fight with Ciri after the battle of Kaer Morhen, refuse the reward for Ciris rescue, not accompany Ciri to talk to the sorceresses, can destroy Ciri Avalac'hs laboratory and visit her grave Skjalls. You must Ciri emperor Emhyr bring var Emreis and put you in the dispute between Roche and Djikstra on Roches side and kill Djikstra. - Bad ending: When bad end Ciri disappears and Geralt remains lonely. Then you need to do this: After the Battle of Kaer Morhen drink with Ciri, accept the reward from Emhyr var Emreis for Ciris rescue, go with Ciri to talk to the sorceresses, give Ciri Laras chain and don’t let her visit the grave of Skjall.